Alex Blum was a good kid with one goal in life: become a U.S. Army Ranger. Then, on the day before deployment to Iraq, Alex got into his car with two fellow soldiers and two strangers, drove to a local bank in Tacoma, and committed armed robbery. The question that haunted the entire Blum family was, Why? Why would Alex ruin his life in such a spectacularly foolish way? In the midst of his own personal crisis, and in the hopes of helping both Alex and his splintering family cope, Ben Blum, Alex’s first cousin, delved into these mysteries, growing closer to Alex in the process. But as he investigated further, Ben began to question not only Alex, but the influence of his superior, Luke Elliot Sommer, the man who planned the robbery. A charismatic combat veteran, Sommer’s manipulative tendencies and magnetic personality lure Ben into a relationship that puts his loyalties to the test. Ben Blum was born and raised in Denver, Colorado. He holds a PhD in computer science from the University of California, Berkeley, where he was a National Science Foundation Graduate Research Fellow, and an MFA in fiction from New York University, where he was awarded the New York Times Foundation Fellowship. He lives in Brooklyn with his wife and stepdaughter. 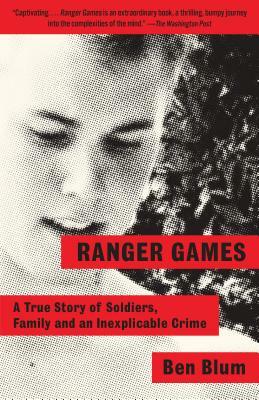 "A gloriously good writer...Ranger Games is both surprising and moving...A memorable, novelistic account." "On a simple level, Ranger Games is about Ben Blum’s obsessive quest to understand why his 19-year-old cousin participated in an inexplicable, ham-handed bank robbery that landed him in prison and nearly destroyed the people he loved. But there is nothing simple about Blum’s book. It turns out to be a labyrinthine, utterly engrossing meditation on matters as seemingly disparate as the perils of loyalty, the seductive force of mathematical certainty, the toxicity of “honor,” the Stanford Prison Experiment, the weirdness of daytime television, and the dangerous power of family mythology. It is an astonishing book, unlike anything else I have ever read." "Ranger Games is a rare and totally original work of nonfiction. The odd characters and dangerous situations live vibrantly in these pages and the stakes are always high. Ben Blum's search for truth leads him down many paths into an inner turmoil and boil about family, fidelity, identity, good and evil, and military service. Once you start reading you won't put it down."